Is the Bible the oldest book in the world? In your opinion, is the Bible’s oldest book? No, nowhere in the Bible is written that the texts contained in it would be the oldest written texts in the world. According to historical and archaeological science, the oldest writing discovered is considered Prisse Papyrus, because it was written in 2000 BC. 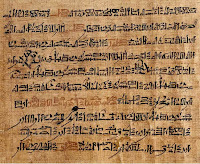 It gives us a copy of an even older text, assigned to a certain Ptahhotep, an Egyptian official who lived around 2450 BC.